From a history in commercial cattle, to establishing a new Highland cattle fold, Catherine McKechnie has always had a passion for quality stock. Lynsey Clark finds out more. The McKechnies have always enjoyed keeping and showing commercial cattle as a sideline to the family’s fruit and vegetable business, near Loch Lomond, but Catherine’s long-held ambition to have her own Highland cattle fold only came to fruition around 10 years ago – and what a decade it has been. In that time, their cattle have secured championships at many of the prominent shows across the coun- try, including the Royal Highland in 2013. 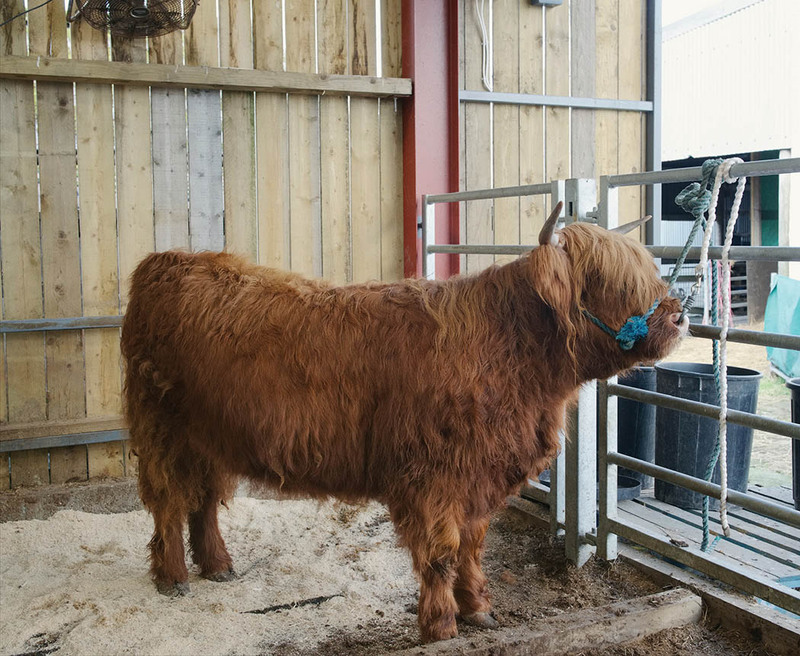 However, it is not the show successes which have had the biggest impact on the family – it is the camaraderie within the Highland breed and the friendship and support they have received from fellow breeders, as Catherine explains. side his brother. Supplying both re- tail and wholesale customers, the business was established back in the 1950s by their father, Jim Snr. Royal Smithfield Show, in London. and Georgie, plus Jamie and Suzanne’s twins, Cameron and Isla, and Jade and Don’s daughter Esmi. Nowadays, the commercial herd is currently down to three cows and two calves, which run alongside 18 Highlanders on 26ha (65 acres), 14ha (35 acres) owned and a further 12ha (30 acres) rented from a neighbour). The first members of the Gartocharn Highland fold were two yearling heifers, purchased at Oban in 2009. Catherine says she liked the look of them, and the fact that they seemed quiet. “Temperament is so important, we do not keep any cattle that are wild, there are no second chances for them here. Jim heads to the fruit market at 1am every week-day morning, so if there is anything calving, I need to be able to handle them myself. That is one of the reasons Highlanders suit us – they calve easily – and they are also easily managed and work well on a simple system. It was the purchase of the show cow, Morag 44 of Woodneuk, from Willie and Tom Thomson in 2010, which allowed Catherine and Jim to make their debut in the Highland show circuit, and Catherine admits she has been ‘hooked’ ever since. Morag went onto have a successful show career, most notably winning the International Highland Cattle Show at Pollock Park in Glasgow, in 2011. The family now shows annually at six local shows and the Royal Highland. Well known stockman and Highland enthusiast, Rich’s help with the cattle proved particularly crucial in 2013, when Catherine was diagnosed with cancer. That year, while she was receiving treatment, Jim led their heifer Bhoidheach Ruadh 1 of Merkland House, to an overall breed championship win at the Royal Highland Show. She had been bought as a calf at foot, alongside her dam. Thankfully, Catherine received the all-clear at the end of 2014 and she has no doubt that family, friends and her beloved cattle all played a part in helping her maintain a positive attitude throughout. Having gotten so much out of being part of the Highland Cattle Society, Catherine gives back her time and effort by being current chairper-son of both the West of Scotland Club and the Society’s advertising and promotion committee. This is in addition to working nightshifts as a palliative care nurse for Marie Curie. She says: “I really enjoy my job. I get to work one-to-one with patients in their own homes, and any stress built up from work is always relieved by my home-life – the cattle, my family and my grandchildren. “I have been chairperson of the advertising and promotion committee since the beginning of this year. We hold fundraising events and also work at promoting the breed in the hope of boosting the member- ship. The membership is currently sitting at 967, with around 400 of them actively registering calves on an annual basis. Also, 80 per cent of the membership are classed as smallholders – most of them have other jobs and keep the cattle as a sideline. “There is a lot of scope to promote the Highland as a crossing breed, especially as native breeds are increasing again in popularity, throughout the UK and abroad. The cattle handling system at France Farm has been improved recently by Jim and Catherine’s son-in-law Don, who has built them a new shed and renewed the crush, replacing it with a wider one specifically for the Highlanders. “The family are great at helping out and if we are away, we know we can rely on them to take care of the cattle. The McKechnies are hoping to show some of their youngsters at the Stars of the Future event at Stirling in November, for the first time. And, they are feeling positive about their own stars of the future, current calves on the ground off the bull Balmoral 2 of Brogach.